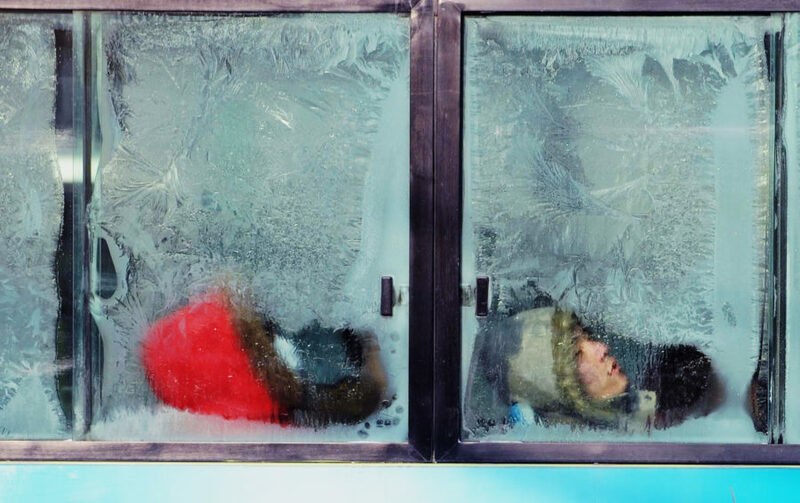 A Chinese man sleeps against an ice-frosted window as he rides a bus after a heavy snowfall in Beijing on January 4, 2010. Image by Stringer/AFP/Getty Images. My head on my arm I fall asleep easily. sleep, child, and dream now the sun is gone. The sun goes to sleep early, and so do I. I have a few weeks between ending one life-cycle and beginning the next. So I burrow into the present moment, until I touch the bright well of timelessness. Beyond sleeping, I walk, I read, and I write. I watch rain clouds scud overhead. I eat foods that are simple and wholesome. Beneath the rough surface of the thinking brain, I glimpse realities that are as rich and unexpected as geodes. I do use the computer, and watch movies. I have a distant relationship with technology these days. I feel an inner resistance whenever I have to respond to an email, or even use the phone. I’m not an antisocial person; I need and love my community. But in these weeks of intense solitude, when the world has granted me a natural pause and is itself preparing for winter, I feel that I too want to still myself, restore myself. Be. The image I have of myself during these weeks is twofold. First, I see a sodden rag being wrung and wrung and wrung. All the tiredness, all the energy I gave and absorbed over the years is being released. The second image is of a bell — a bell being rung and rung and rung. Its sound is one of welcome. It is a signal to the worlds that the silence of my heart is transforming into a call to prayer. We each live and work according to a philosophy we both inherit and invent. The inherited part is easier to articulate. We can dive into Einstein or the Bible or the Bhagavad Gita, and find the lineage of our world-view, already manifest. Our invented philosophy — the self-made scaffold our lives and visions cling to — is harder to speak out loud. It’s hard to even write it down. And yet, we must try! For we hang our very beings on these invisible bones. I am learning to see hibernation as a time to retreat from the world, yes. It is also a time for my own unspoken philosophy to come into clearer focus. In this way, hibernation is a time of approach. I am approaching the truth in me, a movement that requires both patience and trust. One way of facilitating this process is to have some of the conversations I wish I could, with some of the great minds I wish I’d met. It’s possible, for example, to have an honest-to-God, heart-to-heart with Blake, or Lao Tzu, or Tagore. In the workaday world, these are called flights of fancy. But in the world of hibernation, as in the cave, these are not fantasies. They are friendships inscribed so deep in the “now” that, like a child’s hole dug to China, they emerge us into a new reality. I’m so often amazed when I pick up a book, and the exact thought that had been floating through my mind a moment before is staring up at me from the page. Since I have the house to myself, nothing stops me from raising my hands over my head and saying “Thank you!” out loud. To what or whom I am giving thanks is a mystery. The universe has created a conscious soul capable of making a random act like opening a book meaningful. Isn’t that marvelous? For that alone, I give thanks. One of my rituals during these weeks is to drive into the mountains, to visit a chapel on a university campus. The chapel is built from the stone of the mountain. Standing inside, I cradle my fatigue within the deep energy of rock, water, and plant life. I say a few prayers, or read a poem. Then I drive back down the mountain, and go to sleep. I’ve never been good at resting, taking time out, or giving in to exhaustion. For years, I bought into the mantra that doing is better than being, that productivity is the measure of self-worth. An active life is a good and laudable thing. Action has its seasons too — one of which is inaction. When this time between times was gifted to me, initially, I fought and fought. I sank into depression. There were days when standing or taking a walk was nearly impossible. The earth was hungry for me. I sank deep. Then, I realized that instead of seeing this sinking as a bad or frightening thing, it was actually a needed counterpoint. I’ve lived so long in the upper registers of my body — in my head, throat, and heart — that to connect to the parts of me rooted to the ground is not only necessary, it is imperative. Of course it’s been uncomfortable. Many new experiences are, especially those that require total honesty and a willingness to change. But as soon as I stopped the guilt-trips and submerged myself in the rich humus of not-doing, a late-fall flowering occurred. Perhaps you could call it alignment or integration. It is the experience — fleeting, but profound — of the possibility of moving toward wholeness. Let me tell you, even the hope of wholeness is as fearsome as being unmoored in deep space. It is so immense until, from that dizzying height, you orient yourself to Earth and see your true self — through cloud and rain and dust — doing the work that brings you to life. The vision may last only an instant. But it stays with you, and guides you, when you wake. So hibernation is a threefold time. It is a time for retreat and replenishment. It is a time for our wordless philosophy to finally be born. And it is a time for our hidden destiny to whisper in our heart, You’re not forgotten. I’m still here. We’re in this together. One night, I drove out to a nearby dam. I parked my car on a deserted road and shut off my headlights. I rolled down the window and stared up at the sliver of moon and all those stars. I’d never experienced darkness quite like this before. The pine forest around me held sleeping birds of prey that I could sense, vividly. I finally understood why children have an innate fear of the dark. It is not the darkness of the bedroom that scares them. It is their knowledge of the ancient dark, of a time we barely had fire to carve a space for ourselves in its dense secrecy. I stayed only a few minutes by the dam. Then I flipped on my brights, and sped home. Moments like that — of coming closer to the rhythms and mysteries of life beneath our thin shield of technology and distractions — is one of the many gifts of hibernation. Returning to that hope of wholeness is always an approach, never an arrival. Times of deep sleep and silence make even this radical hope possible. It is radical — from the root — especially in a world that tears us apart, then shames us when we take time for healing. Hibernation, which is another word for healing, restores our nourishing, grounding source. In so doing, it frees us to become a force of reason, reflection, and kindness. In simple terms, we’ve been given to. So we have something to give. And not just any something. After a deep replenishing, what we give is veined with truth. So light a fire, and pull on a sweater. Let the snow curl by the door. Listen to the hush of trees or traffic. Andréana E. Lefton is a writer, traveler, researcher, and educator. She has an BA in International Relations and Education from American University in Washington DC, and an MSc in Philosophy & Public Policy from the London School of Economics. She is also interested in finding connections between education, social justice, and creativity. 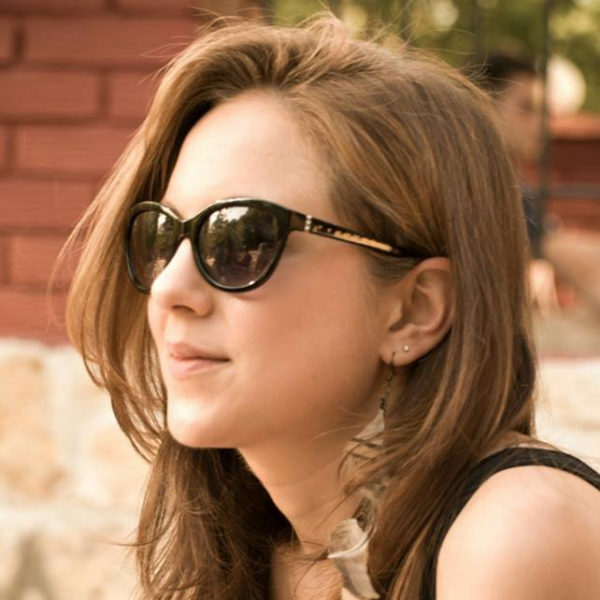 Andréana has lived and traveled throughout the United States, UK, Europe and the Middle East. She has worked with Ashoka, the Institute for Educational Leadership, Eastside Educational Trust, the European Press Prize, and The Guardian. She has also worked on documentaries for broadcast on National Public Radio and the BBC. She recently designed and taught course at Central European University on “Voice and World” exploring the intersection of self-expression and social justice. Sculptural artist Dario Robleto is famous for spinning and shaping unconventional materials — from dinosaur fossils to pulverized vintage records, from swamp root to cramp bark. He joins words and objects in a way that distills meaning at once social, poetic, and scientific. He reveals how objects can become meditations on love, war, and healing.